Texans could soon have more direct control over the property tax rates that cities, counties and special purpose districts set as legislation that stalled during the state Legislature's regular session is taken up by both chambers this week. State Sen. Paul Bettencourt said his controversial Senate Bill 1 is key to “slowing down” rising property tax bills. "The public knows if there's a case that's made from elected officials that they should spend more of their hard-earned money, they will vote for it," the Houston Republican said Monday night. Sen. Dawn Buckingham, R-Lakeway, successfully amended the bill to allow residents in smaller taxing units that collect less than $20 million in revenues — such as tiny towns or special purpose districts — to lower the property tax collection increase that triggers an automatic election from 8 percent to 4 percent. Texans in such small taxing units would vote to lower that threshold in May. Bettencourt is optimistic that the Senate and House will agree on how to handle property tax rate elections during the special session. Their inability to do so during the regular session partially prompted Gov. Greg Abbott to call lawmakers back to work this summer. “What I hope to have happen is a real negotiation,” Bettencourt told The Texas Tribune last week. During the regular session, a proposed automatic tax rate election provision never made it out of the House Ways and Means Committee that State Rep. Dennis Bonnen chairs. Things could play out differently during the special session. Bonnen, R-Angleton, included an automatic election provision in his companion legislation, House Bill 4. He said a heightened focus on property taxes during the special session could prompt more of his colleagues to back such an election requirement. “I think it’s going to be a little harder to sit back and not support something,” Bonnen said. But not everyone shares his optimism. State Rep. Jonathan Stickland, R-Bedford, said Monday that he doesn't think Texas House Speaker Joe Straus wants an automatic election provision to pass even though such a measure is in the House companion bill. HB 4 is among nearly three dozen property tax and appraisal bills that will be considered in that chamber's Ways and Means Committee on Tuesday. "I don't think Straus wants to pass any of them," Stickland said Monday. "My plan is to keep pushing so we know who is responsible for their death." Tea Party-aligned lawmakers and officials, including Stickland, have repeatedly criticized the Republican speaker for how he runs the lower chamber. But Straus spokesman Jason Embry said property tax legislation is a priority for the speaker. Embry also said the House attempted to lower property taxes in the regular session by putting less of a financial burden on school districts. The lower chamber passed House Bill 21, which sought to increase state education funding by $1.5 billion. The bill died after the Senate lowered that amount and tacked on an amendment that would have would subsidized private school tuition and homeschooling for kids with disabilities. "School districts collect more than half of the property taxes paid in Texas, and the House is the only body that has acted to address the most significant driver of higher property taxes," Embry said. Meanwhile, critics of Bettencourt's election requirement say it will hamstring local governments’ ability to respond to residents’ demands for services like police and fire personnel, street repairs and timely trash collection. They also point to it as another example of state officials trying to micromanage local governments. 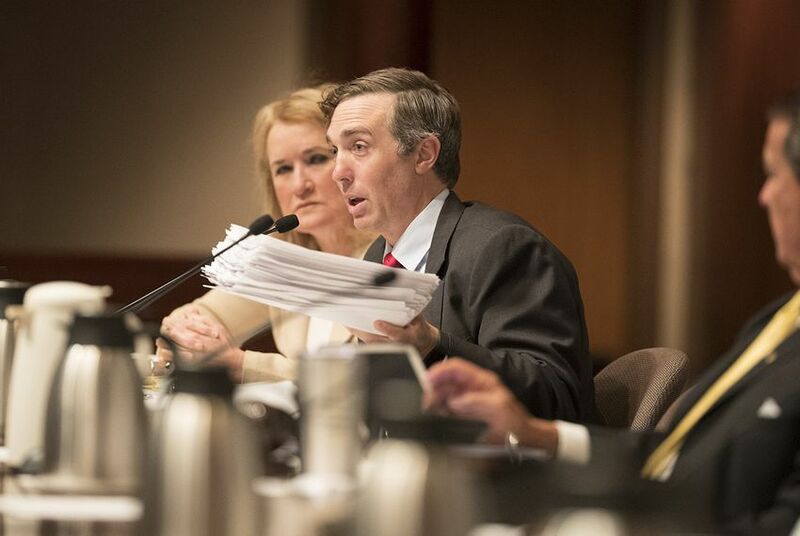 Bill Longley, legislative counsel for the Texas Municipal League, said this weekend at a Senate committee hearing that the legislation would harm local governments’ bottom line while failing to offer Texans substantial savings. He also said the biggest driver of property tax increases are from school districts and not cities or counties. Several city and county officials say that lawmakers are using the city and county property tax issue as a way to distract from their practice of spending fewer state dollars on education, which prompts school districts to raise their property tax rates to make up the difference. “The state’s own budget is based on the largest portion of property taxes — school property taxes — increasing,” Longley said. Bonnen's version triggers a vote when increased revenues exceed 5 percent. But Bettencourt isn’t sweating that slight 1-point difference between the two versions. Both lawmakers also opted to separate property tax rate elections and overhauling the property appraisal process in legislation during the special session. They said having more bills to address property taxes increases the chances of legislation passing during the special session. “It’s just important to have a few vehicles that can be used as necessary because you don’t have time to start the whole process again,” Bettencourt said. Bonnen said his proposed overhaul of the appraisal and assessment process will make it clear to Texans which government entities are causing tax bills to increase. Bonnen said some local officials don’t lower tax rates to offset property value increases and then blame higher individual tax bills on those rising property values. “You still have a local elected official making a choice that makes you pay more,” he said. Bettencourt’s Senate Bills 93 and 96 have provisions that also seek to make it more clear to landowners what tax rates different entities charge and what could trigger an automatic election. Those have yet to make it out of the Senate Select Committee on Government Reform. That committee, which Bettencourt chairs, heard hours of testimony on property tax legislation Saturday. Bettencourt kicked off the hearing by rolling through a PowerPoint presentation purporting to show soaring property taxes across Texas, citing statistics that some experts have called fuzzy math that takes statistical comparisons out of context. Sen. Van Taylor, R-Plano, said his office had received 434 pages of letters from constituents complaining about property taxes, with some saying they were in danger of losing their homes due to rising taxes. Taylor grew emotional as he read excerpts from the letters. “The purpose of government is to protect our God-given rights, it’s not to tax us out of our homes,” Taylor said. Some current and former local officials said they supported Bettencourt’s property tax legislation, SB 1. Ron Wright, tax assessor-collector in Tarrant County, said it would offer relief and more transparency to taxpayers. And he dismissed criticism from those who call the bill an assault on local control, citing the ability of citizens to vote on tax increases. “When they talk about local control, they’re talking about government control,” Wright said of the bill’s critics. Andy Duehren, Emma Platoff and Shannon Najmabadi contributed to this report. Disclosure: The Texas Municipal League has been a financial supporter of The Texas Tribune. A complete list of Tribune donors and sponsors can be viewed here.